The default settings for Adobe Premiere are designed for working on one editing station only, not multiple stations. Because F&DM has a computing environment which requires mobility and the use of external hard drives, please use the following settings to help avoid issues when relocating from station to station. Setting #1: Set your Scratch Disk settings correctly. 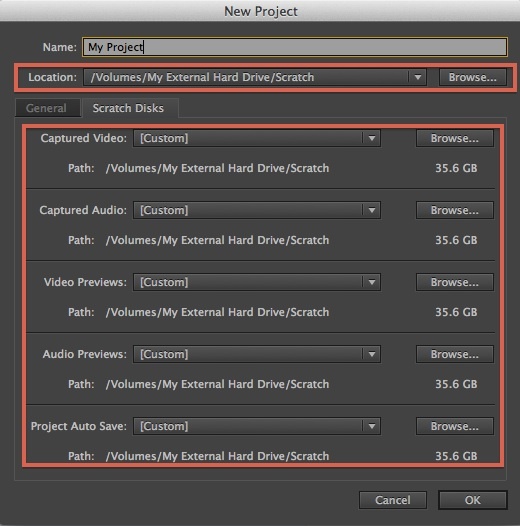 When you make a new project, in the “New Project” window which automatically opens, be sure to specify a location on your external hard drive as the location for all of your Scratch folders. Click the “Browse” button next to each section and navigate to a location on your external hard drive. In this example I set them to a folder called “Scratch” on my external hard drive. 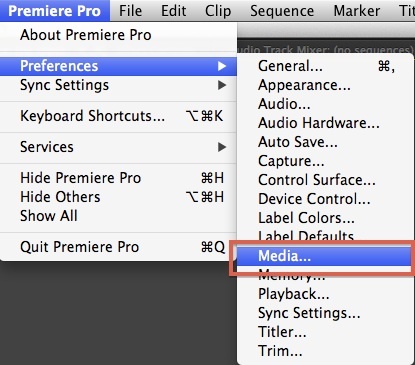 Note: you only have to configure this setting once per project because your Premiere Project File always remembers these settings and will successfully travel with the project once set properly. 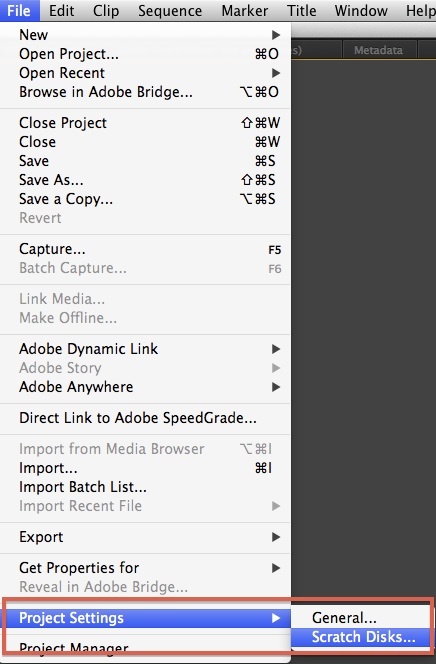 Setting #2: Set your Media Cache settings correctly. Step 2, in the new window that opens, do not check the box that says “Save Media Cache Files Next To Originals When Possible”. 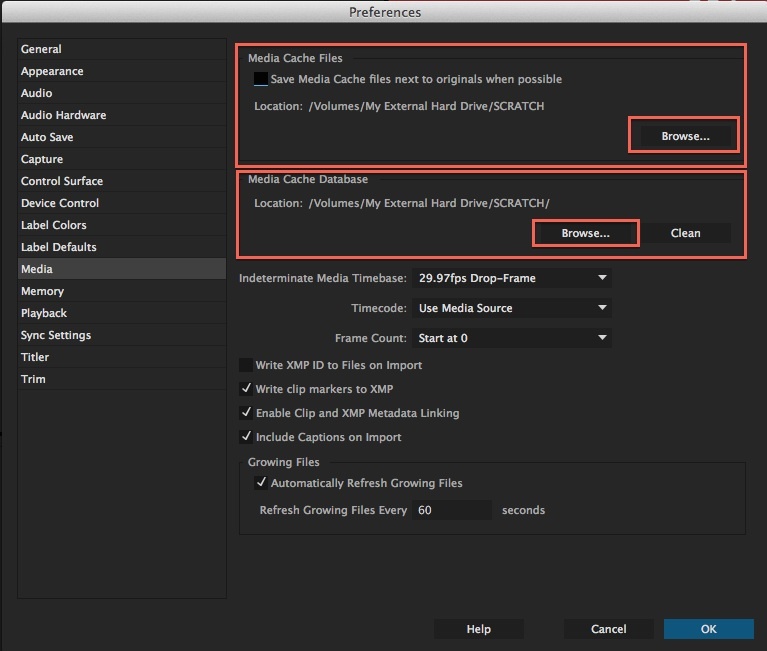 After that, set location for the Media Cache Files and the Media Cache Database setting to a location on your external hard drive by clicking the “Browse” button for each setting. Note: On your personal computer, this setting will only need to be set correctly once because the computer will remember the setting. However, on our F&DM editing stations which are in a frozen state, this setting must be set every time you open and/or use Premiere.